Brian Welch of Hopkins County won first place in the final round of Kentucky Farm Bureau's 2018 Discussion Meet. 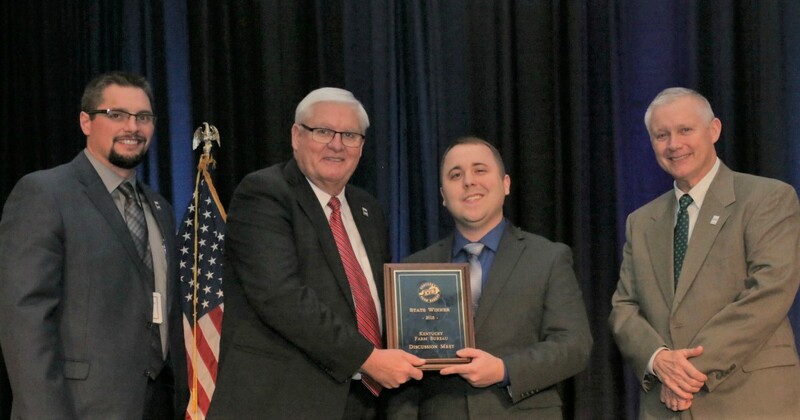 Pictured above are: Director of Young Farmer Programs Jackson Tolle, KFB President Mark Haney, Brian Welch, and KFBF Executive Vice President Drew Graham. Kentucky Farm Bureau's Discussion Meet is a debate-styled competition for young farmers that relies on an individual’s skill in reasoning and logical discussion of issues. The competition tests entrants on their basic knowledge of critical farm issues and their ability to respond in a panel setting to differing points of view. The Discussion Meet preliminary and semifinal rounds will be held on Friday, July 26, 2019, during the Young Farmer Summer Outing in Somerset, Kentucky. The Final Four contestants will be announced the following day during the outing. The final round of the Discussion Meet will be held at the 2019 Kentucky Farm Bureau State Annual Meeting on Friday, December 6, 2019. There may only be ONE Discussion Meet contest entry per county. The registration deadline for the Discussion Meet is Friday, June 14, 2019. If you need additional information explaining the format of the Discussion Meet, please contact your Area Program Director.